The 2017-18 Ontario Hockey League season was loaded with highlights from start to finish. Through the power of social media, many of these highlights were shared and viewed by thousands of hockey fans around the world. 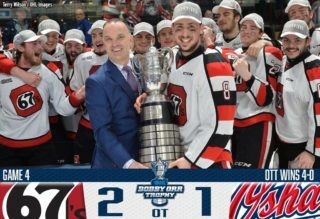 From great plays, to milestone moments, awards, achievements, and championship celebrations, here’s a look back at the OHL season as showcased through 40 of the league’s most popular Twitter posts. WATCH THIS: Quite the 1st impression. WATCH THIS: From Russia (x3) with love. First career hat-trick for top #NHLDraft prospect Andrei Svechnikov powers @OHLBarrieColts. Introducing Team #OHL leaders! @RussianRocket13 named captain with @jonathanang21, @BabyMiddz, @nsuzuki_37 alternates for Game 4 @CIBC #CANvsRUS. From #OHL excellence to a storied 23-year #NHL career to #HHOF enshrinement. From 6-0 to 7-6 in 26 minutes. 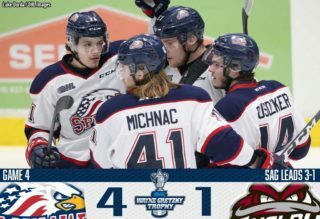 Epic comeback Saturday by @SpiritHockey with goals by Busdeker, Penman, Jenkins, Stepien, Gilmour, Giroux, and Coskey. 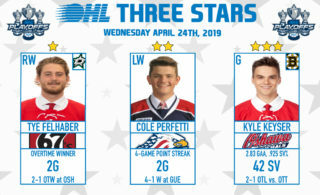 #OHL talent strikes gold in Buffalo. Congrats @brettmckenzie12! @Canucks prospect becomes 1st player in 2017-18 season to reach 300 career #OHL game milestone. #OHLDay Feature: Jake Murray’s undeniable perseverance from battling cancer to achieving his hockey dreams @BulldogsOHL. 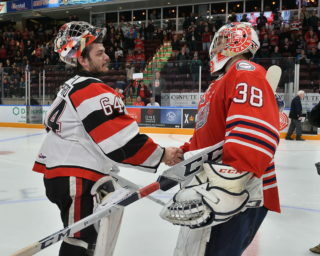 Another shutout and record for @miketendy. @Canucks prospect breaks @SpitsHockey single season mark for the second straight year. Special RP helmet decals now worn by all players at #OHLCup in memory of @03DMF Bantam Goaltender Roy Pejcinovski. Congrats to @Senators prospect @ALuchuk91 of @OHLBarrieColts claiming Eddie Powers Memorial Trophy for 2017-18 with 115 points in 68 games. Minor Midget Champions 🏆@JrCanadiensAAA celebrate their second #OHLCup powered by @UnderArmour title, first since 2008, with 5-1 win over @vaughankingsAAA. Tie game. 3 seconds left. @OHLHoundPower shorthanded. @_morganfrost_10 wins the draw. @Raddy1998 to @conortimmins21. Congrats @JordanKyrou! @StLouisBlues prospect voted 2017-18 Red Tilson Trophy recipient as #OHL‘s Most Outstanding Player of the Year with 109 points in 56 games. 2018 #OHL Champions 🏆@BulldogsOHL win Robertson Cup bringing @cityofhamilton their first #OHLChampionship title since 1976. Congrats @RThomas_27! @StLouisBlues prospect voted 2018 #OHLPlayoffs MVP and recipient of the Wayne Gretzky ’99’ Award with 32 points in 21 games for @BulldogsOHL. Congrats @KFulch70! @DetroitRedWings prospect earns Hap Emms Memorial Trophy as Most Outstanding Goaltender at #MCMemorialCup. Longtime voice of @OHLRangers, Don Cameron, has sadly passed. The #OHL family joins @CoachsCornerDC, @RonMacLeanHTH, and the entire hockey community in mourning the loss of a true gentleman and legend of our game. Longest serving leader @Lemcke_97 of @BulldogsOHL was presented with the Mickey Renaud Captain’s Trophy. 35 players selected in 2018 leads all leagues representing 16% of all picks and includes 19 forwards, 14 defencemen, and 2 goaltenders. Follow our 2018 #NHLDraft picks, returning prospects, recent grads, and free agent invites.